The collected SNMP data can be displayed in 4 MRTG graphs. A yearly graph : trend of the last year, sampling interval is 24 hours. 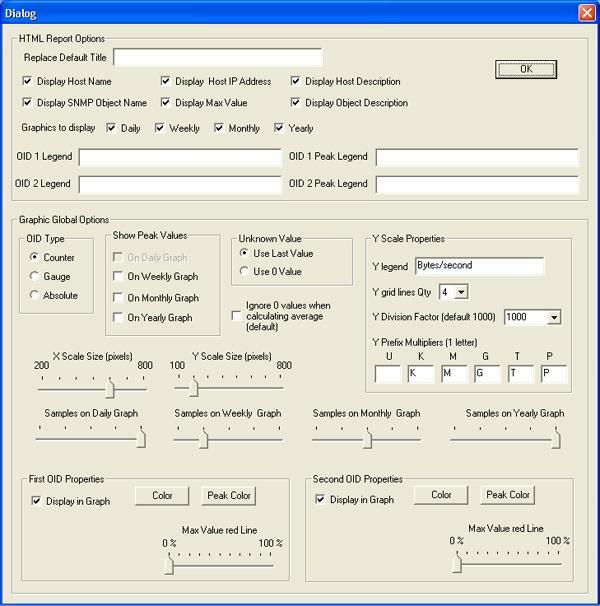 This Trend View ( MRTG for Windows Front End ) Plug-in program uses the well known concept of MRTG and one of its software components (rateup.exe) for creating the graph. MRTG stands for Multi Router Traffic Grapher, details on this project are available on the Web at http://people.ee.ethz.ch/~oetiker/webtools/mrtg/. We could consider that this program acts rather like a front end of MRTG. Remark: The Trend View MRTG Front End plug-in is an alternative to the embedded Graph Interface MRTG style option available since Version 1 of Loriot. You can still use this graph tool and Trend View ( MRTG Front End ) simultaneously. Both software use rateup.exe program to create graph and log snmp OID ( SNMP object ID ) values. The first one allows you to graph only network interface traffic and has no customization option. If you still want to use the old solution don’t forget to check the option use PNG version of rateup in the menu Configuration -> MRTG style graph process window. The Trend View ( MRTG Front End ) Plug-in generates report in an html format and provided result as 4 graphs. one that displays the trend of the last 24 hours, sampling interval is 5 mn. one that display the trends of the last week, sampling interval is 30 mn. one that display the trends of the last month, sampling interval is 2 hours. and one that displays the trends of the last year, sampling interval is 24 hours. Configuration options allow you to customize the look of the graphics and the WEB report. 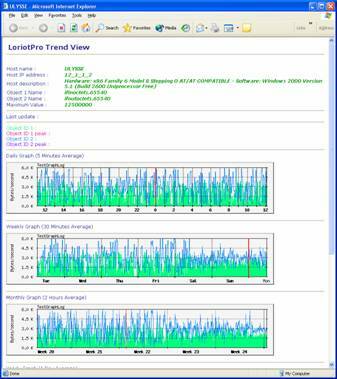 The trend Report is also accessible from the LoriotPro remote console. The Trend View ( MRTG Front End ) Plug-in is a directory Plug-in and should be attached to a host in the directory tree. The minimum sampling interval for the daily graph is fixed to 5 minutes. The set of collected data of the last day is stored in a file that contains all the samples and also the results of the consolidated data. Consolidation is done on the following rules. The sampling interval for the week representation is 30 minutes. The sampling interval for the month representation is 2 hours. The sampling interval for the year representation is 24 hours. The SNMP Object to graph could be set individually by using the OID ( SNMP object ID ) selection Wizard or selected from a template. Templates store common set of OID ( SNMP object ID ) peer with other required information for a correct display. Trend View ( MRTG Front End ) uses a software component of MRTG called rateup.exe. This software has two main roles. First it is used to store the collected data in a log file and make the consolidation of the data based on their average in ever increasing laps as mentioned before (30 mn, 2 hours etc.). Second it creates the 4 images in png format used in the report. 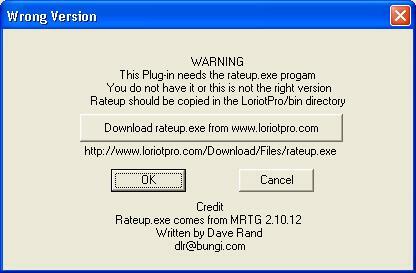 The rateup.exe program should be present in the /bin subdirectory of LoriotPro for Trend View ( MRTG Front End ) having running. If it is not the case a pop up dialog box is displayed asking you to install or download it. We get the rateup.exe program from MRTG version 2.10.12 which is available for downloading on the MRTG official WEB site : http://people.ee.ethz.ch/~oetiker/webtools/mrtg/. MRTG as open source software is not available with LoriotPro package by default. We provide with Trend View ( MRTG Front End ) only a frontend to the rateup.exe provided in the MRTG package. When the plug-in is attached to a host in the directory, it can be configured and started. If a first set of graph is available (after one or two polling) a single click on the plug-in will automatically open the web navigator and the report. Else the properties dialog box will be displayed. The properties dialog box allows you to set all the required parameters. Additional options are available if you want to change the default look of the report and of the embedded graphics. The main and minimum job to do when configuring the Trend View ( MRTG Front End ) plug-in is to select the SNMP objects to graph and the type of these objects (Gauge or Counter). The selection could be done directly from the MIB tree with the wizard selection tool or from a template list. Templates allow you to rapidly select common SNMP objects set without knowing where to find it in the MIB tree. The step to follow for selecting SNMP OID ( SNMP object ID ) from template is simple. First select in the Template Selection list one of the templates. If the template contains indexed object LoriotPro queries the host and retrieves the list of SNMP objects and their index. You should select the index of the object by a click in the index list. Your selection is automatically duplicated in the SNMPOID ( SNMP object ID ) field. The next entries allow you to specify the maximum value for OID ( SNMP object ID )1 and OID ( SNMP object ID )2. If a maximum value is specified, collected value for OID ( SNMP object ID )1 and OID ( SNMP object ID )2 that are upper this threshold will not be add to the graph. When possible, the max value can be collected from a third SNMP object. In our example we read the SNMP OID ( SNMP object ID ) ifspeed value that gave us the maximum value of the interface. As this value is in bits/second and we collect Bytes seconds we have to change the maximum value by a factor of 8. The maximum value that can be collected on our Ethernet 100 Mbps is 12 500 000 Bytes/second. The last information that we can see in the main property dialog box are counter and status boxes. The Polling count displays the number of SNMP get performed on OID ( SNMP object ID )1 and OID ( SNMP object ID ) 2 since the last time we start the Plug-in either by an action on the start button or by a complete start of LoriotPro. The SNMP Get TimeOut failure gives the number of unsuccessful SNMP Get performed on OID ( SNMP object ID )1 and OID ( SNMP object ID ) 2 since the last time we start the Plug-in either by an action on the start button or by a complete start of LoriotPro. The Polling starting date gives the date of the start of the Plug-in either by an action on the start button or by a complete start of LoriotPro. The Last polling date gives the date and time at which the last SNMP polling occurs. Open the advanced option dialog box that allows the setting of the html report look, the graphics size, legend and more. Display the content of the OID ( SNMP object ID )1 and OID ( SNMP object ID )2 value log file. Generate a dummy report with random value for the setting of the report look. Display the html report by generating graphs with the current values stored in the log. The options button opens a second dialog box interface and allows you to better customize the details of your report. The first set of options allows you to modify the Html report look. The host name as it is defined in the LoriotPro directory. The host IP address as it is defined in the LoriotPro directory. The host description got from the sysdesc mib2 SNMP object. The object name and its index used as first OID ( SNMP object ID ). The maximum value allowed for OID ( SNMP object ID ) 1 and OID ( SNMP object ID ) 2. Follow the legend of the graph with their associated colors. The information displayed there can be individually removed from the final report. A check box in the advanced configuration allows you to choose what has to be displayed. You can also choose to remove one or some of the 4 graphs from the MRTG report. The second set of options, Graphic Global Options, allows you to define the look of the MRTG graphs within the reports. The OID ( SNMP object ID ) Type is a very important option and should be correctly set. If you choose a template entry, the template set the value for you, but if you set an entry manually or from the wizard you should set the type manually. It defines the way the MRTG graph is built according to the SNMP OID ( SNMP object ID ) typz. OID ( SNMP object ID ) can be of counter or gauge type. Check how the OID ( SNMP object ID ) is defined in the mib to know what is the correct setting here. If you select gauge the value will be directly reported in the MRTG graph as is without modification. Intermediate peak behaviors that have occurred on the value between two polling interval are never seen. If you select counter the values reported in the MRTG graph are the result of the difference between two consecutive readings averaged on a 5 mn interval. Peak values are present in the counter but most of the time lost in the average calculation. If you select absolute the values reported are the last readings averaged on a 5 mn interval. This option is used when the SNMP agent clears the value each time a read is performed. Remark: Sometimes the OID ( SNMP object ID ) value is already a calculated value (like the cpu usage in the last five minutes) and need to be considered as a gauge even if it looks initially like a counter. In the weekly graph the maximum value recorded among 6 samples in a 30 minutes interval. In the monthly graph the maximum value recorded among 4 samples in a 2 hours interval. In the yearly graph the maximum value recorded among 12 samples in a 24 hours interval. An example of weekly graph with peak values of the OID ( SNMP object ID ) 1 only. If the SNMP request returns dummy or unknown values the graph has to display something instead. You can choose to display the same value as the last red value or display the value as 0. The second option is off by default and removes the 0 value when doing average calculation. The graph Y scale and legend is customized according to the following settings. The Y legend is displayed vertically on the left side of the Y scale. The y grid line Qty defines the number of horizontal lines displayed in the background grid of the graph. The Y Division Factor set the value by default at which the y value are divided and rounded. Example 10000 will be shown as 10 K.
Y Prefix Multiplier changes the default K (Kilo), M(Mega),G(Giga),T(Tera),P(Peta) letters use to define the unit of the Y values. The graph can be sized in height and width. Minimum and maximum are predefined. By default the graph has a width of 600 pixels and a height of 200 pixels. The number of samples to show in the graph is also settable for each of them. Changing the default values can lead to ugly graphs. The Display in Graph option allows you to remove one SNMP OID ( SNMP object ID ) from the graph. This option is useful when showing peak value to have clear graphs. Max Value red line adds a red line in the graph indicating the maximum value than can be reached by OID ( SNMP object ID )1 and OID ( SNMP object ID )2. The Y scale is automatically set for displaying the maximum possible value and not only adjusted to the maximum read value (autoscale function of rateup). In the example below, the Max Value red Line have been set to 100 % for an Ethernet interface at 100 Mbps. As we choose to convert Bytes to bits we have a direct reading of the interface usage. The color of each line of the graph can be change at this level by selecting a color for the values and the peak values. The OID ( SNMP object ID )1 will be always looking like a filled line graph and the OID ( SNMP object ID )2 as a line graph. The test button is here to help you to define the look of your report, after changing parameter you could immediately get a view of what will be your future MRTG reports. Templates allow you to create predefined report for frequently used OID ( SNMP object ID ) set. Templates are defined in a text file that is browsed automatically when you open the Trend View ( MRTG Front End ) Plug-in. You can add you own template to the existing list. Templates are stored in a readable file located in the /bin/config/trenview subdirectory. To add a new entry in the template list you should manually edit the template. The structure of a template entry should be strictly respected. // 8 - indexdescription : An object of a SNMP table that best describe the table entry. A set of template is provided by default. You can find in the table below a description of theses templates. MRTG Graph of the total number of octets received and sent on a network interface, including framing characters. Graph the number of inbound packets which were chosen to be discarded even though no errors had been detected to prevent their being deliverable to a higher-layer protocol. The total number of UDP datagrams delivered and received. MRTG Graph of the number of frames send and received from the network indicating forward congestion since the virtual circuit was created. MRTG Graph of the number of octets of user data sent and received for an X25 circuit. Graph the number of active outgoing and incoming circuits. This includes call requests sent but not yet confirmed. This does not count PVCs. Graph the number of times TCP connections have made a direct transition to the SYN-RCVD state from the LISTEN state (passive connection) and from the SYN-SENT state from the CLOSED state (Active Connection). MRTG Graph of the number of messages received and sent since MTA initialization. MRTG Graph of the number of queries which were authoritative and non-authoritative (cached data) answered. MRTG Graph of the number of outgoing requests and responses to these requests. Graph the count of successfully transmitted frames on a particular interface for which transmission is inhibited by exactly one collision and graph the count of successfully transmitted frames on a particular interface for which transmission is inhibited by more than one collision. MRTG Graph of the percentages of user and system CPU time. Trend View ( MRTG Front End ) generates graphs with the collected value of OID 1 ( SNMP object ID ) and OID 2( SNMP object ID ). Each host in the directory get when created a unique UID, a large number that identify it among other. The report and graph attached to a Trend View ( MRTG Front End ) plug-in is built with this number and stored in the /bin/www/mrtg subdirectory. This subdirectory contains also the log file with the collected SNMP object ID 1 and SNMP object ID 2 values. To find the set of files used by a plug-in look at the report and read the upper left value.